The shipping crisis of the 1970s and 1980s almost eradicated Norwegian shipping. The 1987 establishment of the Norwegian International Ship Register was the brainchild of Erling Dekke Næss. The NIS enabled the use of foreign, low-cost seamen on Norwegian ships trading internationally, and can be characterized as “the kiss of life” for Norwegian shipping. The timing was perfect—around the same time the shipping markets improved, and this paved the way for massive new investment. Tenold shows that parallel with the resurgence in traditional deep-sea shipping, there was substantial investment made in offshore petroleum exploration by Norwegian shipping companies. How do you accept the disappearance of an industry that for more than a century has been the most important source of foreign exchange, neutralizing the balance of trade deficit and enabling crucial imports? You don’t. You take up the fight, look for solutions and try to adapt. And you accept that help may come from the most surprising quarters. Although he was based abroad, Dekke Næss had been a frequent visitor to his home town, and he had donated large sums of money to an Institute for Shipping Research and to a first-class museum in Bergen, telling the history of the city’s medieval roots.2 Now he had come back to his native country to offer his solution to the extreme crisis that haunted Norwegian shipping. The forum was a meeting of shipowners in Oslo—the date was 11 January 1984. The fundamental premise for the plan that Erling Dekke Næss presented, was a feature that had been characteristic of Norwegian shipping for more than a century: the fact that the ships served the world market, not Norwegian exporters and importers. This implied that the majority of the Norwegian-owned tonnage never visited ports in the home country. Consequently, given that Norwegian shipping was an international industry, its scope should be international. The basis for Norway’s competitiveness had changed during the 20th century. A starting position based on low-cost shipping, with old ships and superior seamanship, was replaced by a combination of economies of scale, automated ship operation and innovative specialized tonnage. Technology gave the Norwegians a competitive edge, and neutralized what had now become a labour cost disadvantage. When the shipping crisis struck, and the market became characterized by massive overcapacity, there was little reason to invest in new tonnage. When it was no longer possible to invest in labour-saving technologies, the Norwegian companies’ ability to create competitive advantages was reduced. The country still had a well-functioning maritime infrastructure, high competence onshore and offshore, an affinity for the sea and long maritime traditions. However, in a cut-throat competitive situation, this was insufficient to remain afloat. In the period from 1970 to 1987 the number of shipping companies operating in the international market fell by more than two-thirds and the newly established businesses were too few and far between to alleviate the losses to any great extent. From 1970 to 1987 there were only three years when the number of companies increased. On average 15 companies disappeared every year, while only nine new companies were established. There was also a marked acceleration towards the end of the period; in both 1985 and 1986 more than 30 companies sold or transferred their last ships under the Norwegian flag. Table 8.1 illustrates the massive decline in the fleets of the most important Organization for Economic Cooperation and Development (OECD ) nations, and also shows that Norway was harder hit by the crisis than other European countries.3 Only Denmark and Greece saw their fleets increase from 1973 to 1987, but even these “relative winners” experienced tonnage flight in the first part of the 1980s. The UK continued the relative decline that had characterized the country for most of the 20th century and saw the largest tonnage loss in absolute terms. In fact, the amount of shipping tonnage that disappeared from the British flag in the period 1980–1987 was larger than the whole UK tonnage in 1900, when the UK controlled around half of the world fleet. This says something about how much the world fleet had increased in those eight decades, but also indicates the extent of the flight from the flag. In relative terms, the Norwegian experience was even more dramatic, but only barely so—in both the UK and in Norway the merchant marine fell by more than three-quarters. The decline also started earlier—in contrast to other countries, the UK and Norway had less tonnage in 1980 than in 1973. Norwegian shipping was on its death bed and awaiting the last rites. But, instead of the four horsemen of the apocalypse, the combination of a clever political manoeuvre and a rapidly improving market appeared on the horizon. The idea of an international register, which Erling Dekke Næss in 1984 presented as the solution to the problems, was first received with little enthusiasm. Large-scale sales to foreign owners and the illusion of “temporary” flagging out to low-cost registries clearly showed that shipping companies could no longer be competitive when flying the Norwegian flag. However, this new reality was difficult to accept. Most shipping industry associations, the authorities and, in particular, the seafarers’ unions , were negative about the idea of a “second” or “open” register where foreign labour could be used. Even the Norwegian Shipowners’ Association was lukewarm. Its main concern was access to register ships abroad, and it probably feared that an inferior Norwegian solution might lead to the reintroduction of restrictions on the use of foreign flags. Nobody took responsibility for the Norwegian predicament. The seafarers and the government blamed the shipowners, who had been greedy and had taken on too much risk. The shipowners blamed the government for its tax and labour policies, and the trade unions for their wage demands and expensive social requirements. At first, everybody blamed the markets. Then, everybody blamed foreign competitors. Still, with the massive outflow of tonnage in 1985 and 1986, it was evident that the old template was no longer sustainable. World shipping had gone through massive changes, both in technological and organizational terms. Norway had only participated in the first of these transformations. In 1967, when the Norwegian Shipowners’ Association’s Managing Director, David Vikøren, presented Norwegian maritime policy at an international conference, he emphasized the fact that Norwegian shipping had “maximum freedom to combine the factors of production as efficiently as possible, regardless of national considerations.”6 The term “maximum freedom” is revealing. At the time, the “factors of production” appeared to be mainly the ship itself, and the important elements in this respect were access to ships, finance, insurance and markets abroad. The restrictions on the nationality of the seafarers were not taken into account. The ban on the use of Flags of Convenience was not even mentioned. This perception of reality was gradually challenged—by the shipping crisis, by strong relative growth in Norwegian labour costs, and by the changes in the organization of world shipping, including the increasing use of Flags of Convenience . From 1980 to 1987 more than 15,000 jobs for Norwegian seafarers disappeared as a result of sales and flagging out; “the 1980s turned into a painful blood-letting that threatened to wipe out the Norwegian seafarers.”7 The old ideas of what “Norwegian shipping” should and could be had to be reformulated. Gradually, the shipping organizations, the authorities and the seamen’s associations were forced to acknowledge the need for change. In 1981 a Parliamentary committee on shipping unanimously supported the idea that Norwegian shipping should be based on Norwegian ships, displaying the Norwegian flag and employing Norwegian seafarers.8 Gradually the crisis forced a relaxation of the requirements. The ban, with minor exceptions, turned into temporary permissions. The temporary permissions turned into permanent access, with minor exceptions. Free access to register ships abroad had been one of the main strategies of the Norwegian Shipowners’ Association. There was initially a reluctance to accept the ideas about the Norwegian International Ship Register (NIS). However, as the crisis became broader and more intense, a working party, established in late 1985 and led by Egil Abrahamsen from the classification society Det Norske Veritas , reformulated the goals and the policy. At this point, shipping policy became maritime policy. By considering the fate of the whole maritime community—not only the shipping companies, but auxiliary service industries, shipbuilders and so on—the effects became more visible and weightier. Political clout improved. Norges Rederforbund [the Norwegian Shipowners’ Association] had good political connections, in particular in Høyre [the Conservative Party]. The Prime Minister , Kåre Willoch, had worked for the association in the 1950s, and he still received a salary from Norges Rederforbund when he was a Member of Parliament.9 The association was known as one of Norway’s most efficient lobbying organizations, and now it was fighting for its life. When the shipowners changed their minds, the politicians followed suit. In April 1986 the Conservative government referred to the current problems in shipping when it announced its aim to establish an international register. However, a change of government led to a postponement, as the new Labour government wanted to confer more closely with the unions. The seamen’s organizations were extremely negative to what they referred to as “wage-based apartheid” on Norwegian ships—for a long time they were against any system in which Norwegian and foreigners would receive different wages.11 They denounced the “racism, slavery conditions, starvation wages and lawlessness” that the NIS would introduce.12 This was a two-faced stance, however: internationalization had already reached the seamen’s organizations. Norsk Sjømannsforbund had since 1983 operated a hiring office in Manila, where sailors—if they paid fees to the Norwegian union—could be employed on Norwegian vessels without triggering the boycott threat. This was a pragmatic approach with long traditions—in the 1950s Norwegian seafarers were urged not to sign on Panama-registered vessels, unless they were given a contract in which the seamen’s organizations in the United States had accepted the salary and the working conditions. At a conference in Oslo in 1948, the International Transport Workers’ Federation decided to introduce a boycott of Flags of Convenience and throughout the post-war period the Norwegian seafarers’ organizations had a more hard-line approach to such registers than similar unions in other countries. The Greek shipping organization in London went so far as to claim that the motivation for the Norwegian fight against Flags of Convenience was to stop the expansion of Greek-owned shipping.13 Gradually, the stigma associated with such flags disappeared. By the middle of the 1980s the Norwegians had not only embraced Flags of Convenience —they had come up with an alternative arrangement. The political process was long and winding, but the bureaucratic response was surprisingly swift. During the consultation, the shipowners’ association had suggested that the register should be opened in January 1988. The Shipping Directorate, however, promised that the moment the politicians had made the decision, it would act rapidly. Moreover, parallel with the preparations for the new register, the legal regime would go through significant simplification and rationalization. The aim was to establish a competitive Norwegian alternative to Flags of Convenience . Consequently, the red tape had to be limited and much of the control function was delegated to the leading international classification societies.14 The new registries, NIS for international vessels and NOR (Norwegian Ordinary Register ) for ships operating in Norwegian waters, were organized under the auspices of the town clerk [Byskriver] in Bergen. As a result of the impressive bureaucratic swiftness, they opened for business on 1 July 1987. Outside the offices, huge crowds were protesting. Inside the offices, the revitalization of Norwegian shipping had begun. When NIS was formally opened in the summer of 1987, the Norwegian-registered fleet consisted of slightly less than 500 ships, totalling 8.9 million dead weight tons (dwt), with a similar number owned from Norway but registered abroad. Because there had been a tendency to flag out relatively large ships, the fleet under foreign flags amounted to almost 16 million dwt.15 After NIS was established there was an influx of ships from the conventional registry, but this reregistration was more or less over by the end of 1988. One condition for NIS-registry was that the owner had a collective agreement with a Norwegian or foreign union. In the early 1990s four such agreements existed; for Nordic seafarers, for Filipinos and Indians, for Polish seafarers and for Pakistani and Indonesian seafarers.16 As such, the Register can be seen as a vehicle of international solidarity, and this was one of the reasons that a Labour government was willing to introduce such an arrangement. The NIS enabled employment for seafarers from poor countries, but on acceptable terms. For a country that prided itself on its “foreign aid,” this was another means of north-south transfer. However, the establishment of the NIS did not imply that foreigners for the first time were employed on Norwegian ships—it just meant that for new groups of foreigners, certain minimum conditions were met. Before NIS, there were legal restrictions on the extent to which it was possible to use foreign labour.17 The most numerous and most well-known group consisted of other European seafarers; in the 1950s particularly from Denmark and Sweden , and in the 1960s and 1970s increasingly from Southern Europe. In the early 1950s around a quarter of the foreigners on Norwegian ships came from Denmark . Ten years later around a third of the foreign seafarers came from Spain , while the proportion of Danes had fallen to less than 10 per cent. There were several reasons that Norway had to “import” foreign seafarers; the strong growth of the fleet, labour-demanding reconstruction, expansion within education and manufacturing employment onshore, as well as the relatively small cohorts from the 1930s coming of age. The Europeans had functioned as “swing capacity”—ensuring that there were sufficient seamen during the tight labour market in the 1950s and 1960s, but disappearing when the market became difficult in the 1970s and 1980s.18 The foreign seafarers were particularly hard hit by vessel sales and rationalization. Given that they were given the same terms as Norwegians, there were no financial incentives behind the employment. The practice had two main reasons. First, it was part of the “international” market for seamen—which had its counterpart in Norwegian seafarers working for ships registered in other countries. Second, it reflected the difficulties of recruitment in a Norwegian economy where attractive employment alternatives were no longer scarce. By the 1970s the system was still in existence on some ships trading along the African coast—locals, usually led by an overseer or headman, lived on the deck and worked very long hours at extremely low wages.23 However, free food and the ability to profit from cast-offs from the ship and petty trading and barter along the coast, made the work sought after. The Africans had few alternative means of income, and the inhabitants of the “Kroo-town” in some African cities had a higher standard of living than the population in general.24 As Norwegian shipping changed, and the liner trade with frequent stops along the African coast was abandoned, the krooboys disappeared as well. Before the shipping crisis, the idea that Norwegian ships should be mainly or completely manned by foreigners was alien even to the shipowners’ organizations. However, by the middle of the 1980s, it was the only workable political reality. This change shows how much Norwegian shipping—and Norway—had developed in the 20th century. A book from the interwar period suggested that “as long as the sea flows outside the door of thousands of homes, as long as it lights the desire to explore and nourishes good seamanship, it is hardly likely that our most traditional industry will stagnate due to lack of suitable labour.”25 By the late 1980s the sea still flowed, but suitable—in terms of suitably inexpensive—labour had to be obtained elsewhere. What can explain this rollercoaster development of the Norwegian fleet, from more than 48 million dwt in the beginning of 1977 to only around 10 million a decade later, before shooting back to almost 38 million dwt in 1991?28 The basis for the reduction is hopefully clear by now—the combination of a collapsing market and unfortunate strategies. What about the rebound? The 57 million tons of shipping registered in Norway and elsewhere was an all-time high for the Norwegian-owned fleet, though the share of the world fleet—which was now slightly less than 9 per cent—had been larger in the late 1960s. There are three main reasons for the rapid ascent after the 1987 nadir; one general, and two specific to Norway. The first specifically Norwegian reason was that many of the ships that had been flagged out—while ownership or control remained in Norway—returned to the Norwegian flag. Although the register, as a public body, had a limited ability to market itself, the Bergen Shipowners’ Association actively promoted the new possibilities. Foreign owners, if they had Norwegian representatives, could register ships in NIS , but the number of foreign-owned vessels entered into the register was very low. By the beginning of 1989 only around 30 foreign-owned ships were included, and by 1992 the foreign-owned share was less than 7 per cent of the total, so this played no important role in the growth. Vastly more important was the fact that Norwegian shipowners saw the register as attractive, both with regard to price and procedures. Moreover, the fact that it had been possible to arrive at a political solution—and one that ensured competitiveness while maintaining the link to Norway—created a sense of optimism. This brings us to the final reason for the rebound: an impressive ability to mobilize capital and identify opportunities. The crisis had taken its toll on the equity of Norwegian shipping companies, on the loan portfolios of the shipping banks and on the recruitment of personnel to ships and shipping company offices. The crisis had proved that shipping was a high-risk business. However, high risk also means high potential profits. The dream of these profits encouraged a massive wave of Norwegian investment. Norwegian investors were willing to take the risk—and they were eagerly encouraged by the authorities. The maritime historian Dag Bakka jr ., who has written a very good account of the revitalization of the shipping industry after the introduction of the NIS , points out that three different types of “shipowners” put their mark on Norwegian shipping in the last part of the 20th century.32 The expansion was orchestrated by “the next generation,”, which took over existing companies, a group of enterprising newcomers, as well as those that had survived the crisis; the old-timers. The first group was a new generation of owners and managers, who took the helm in a number of traditional shipping companies—Bergesen, Kloster, Smedvig and Staubo. The extent to which their inheritance had any real value varied—in many cases the shipping crisis had depleted the value of the companies. However, they had a shipping pedigree, and access to national and international networks. Some of the companies had sailed relatively smoothly through the crisis, others started practically from scratch, with little more than a shipping “name” and a shipping reputation. The second group consisted of experienced owners in established companies—Westfal-Larsen, Fred. Olsen, Leif Höegh and so on. Many of the older shipping companies had a more risk-adverse strategy than the fastest growers in the 1960s and 1970s—their growth was slower, but that also implied that their financial basis was sounder. As we have seen, they were on average more diversified, and had a larger portfolio of specialized ships, than the smaller companies. Some of the established companies collapsed during the crisis, while others were busy restructuring their balance sheets and biding their time until there were new profitable opportunities. In the most fertile instances, the established companies had been divided among different branches of the family, paving the way for expansion along parallel lines, both old and new. In Bergen we find two very good examples of how competition between companies with a joint tradition could give strong growth. Kristian Gerhard Jebsen started his own business in the late 1960s, after leaving the family company, which was taken over by his younger brother, Atle Jebsen. The two brothers were among the most expansive shipowners in the 1980s and 1990s, investing heavily in the specialized bulk markets. Although they both had financial challenges, their companies were among the largest in Norway in the early 1990s.33 Similarly, when the second cousins, Dan Odfjell and Abraham Odfjell, divided the leading chemical tanker owner, Odfjell, in the 1970s, they both managed to build up companies that were in the Top Four of the chemical tanker market. This kind of growth—by spin-offs from established enterprises—was not confined to Bergen. Various members of the Ugland family based in and around Grimstad on the South Coast, also made their mark, with investments in car carriers, shuttle tankers, bulk carriers and product tankers. The final group consisted of a number of entrepreneurs, with various backgrounds, who used their skills and networks to create new business. Some came from shipping companies, others from shipbroking or finance. Among these we find John Fredriksen, who from a base in London would go on to become by far the biggest and most successful Norwegian shipowner in the first part of the new millennium. Another newcomer was Herbjørn Hansson, who had worked for Anders Jahre in the Kosmos-system. He built up a substantial tanker fleet by means of a company incorporated in Bermuda, but with operations in Norway. The strategy has been to raise funds from investors on the New York Stock Exchange, where a large number of shareholders saw shipping as an exotic industry and were seduced by the frequent payment of dividends. Hansson’s business model was quite unique in a Norwegian setting, but in an international perspective, a handful of Greek shipping companies followed the same strategy. Sometimes the newcomers built their business on the ruins of older companies. Jens Ulltveit Moe had been appointed by the main creditor, Bergen Bank, to take over the management of the troubled Knutsen OAS in Haugesund, which had made unfortunate investments in large tankers.34 Together with Trygve Seglem, he built up a fleet of advanced Suezmax shuttle tankers. The phoenix-like Knutsen organization was primarily engaged in the operation and management of the ships—the investments funds very often originated from investors in limited partnerships [ kommandittselskap ] that had actual ownership of the vessels. The kommandittselskap became the “typical” form of incorporation for many of the companies that expanded rapidly in the period around 1990. The financial basis for this type of incorporation was the combination of limited liability with substantial tax deductions for the individual owners. For many investors, the tax advantages were the main motivation for the investments—in the worst cases, projects that had negative expected profits turned out to give a positive return when the tax effect was considered. A number of the projects also had an evident speculative character, where the main aim was “asset play”—a desire to reap the benefits of increasing vessel values—rather than revenue from long-term operation. The limited partnerships were not only linked to deep-sea shipping—they became a favoured means of finance for offshore involvement as well. There had been a steady stream of shipping companies seeking out opportunities in connection with the expansion of the Norwegian offshore sector. First, during the period of high liquidity at the beginning of the 1970s. Second, as a means of diversification when the shipping market wobbled. Finally, as a viable business in its own right, for companies that had managed to build up knowledge about another maritime venture. The reduced importance of shipping in the Norwegian economy was not only caused by the difficult conditions in the shipping market and the reduction of the Norwegian fleet. The transformation of “Norway—the shipping nation” to “Norway—the oil producer” also played a very important part.36 The export of crude petroleum and natural gas, which was non-existent in 1970, made up more than a third of Norwegian exports in the first half of the 1980s. During this turbulent period, growth in offshore petroleum exploration and exploitation became another outlet for maritime capital and maritime competence. The relationship between Norwegian deep-sea shipping and offshore oil production is complex. The activity in the North Sea clearly diverted resources away from the shipping industry—both capital and labour found an attractive alternative. At the same time, with international shipping markets developing the way they did, some kind of constraint on the Norwegian exposure was clearly a good thing. Consequently, while the offshore sector temporarily reduced Norway’s involvement in international shipping, the long-term effects were positive, for at least three reasons. First, a number of shipping companies found another investment object that clearly provided a higher return on capital than the crisis-ridden shipping market. For some it provided revenue in difficult times, for others a completely new business model. Second, activity in the North Sea provided the maritime sector with a new base from which it became possible to build up competence and expand on the international stage. Third, for Norwegian seafarers—who were replaced by low-cost foreigners on the ships in the Norwegian deep-sea fleet—activity in the North Sea provided not only alternative employment, but jobs that were better paid and had more attractive conditions than what they could find working in conventional deep-sea shipping. Geological surveys off the Norwegian coast began in the early 1960s, and the first well was drilled by Esso in the summer of 1966. The shipping companies became involved in a number of projects and activities related to the new industry; investment in oil companies, in onshore bases, in supply ships and, as a swarm of bees in the first half of the 1970s, in oil rigs. One reason for the shipping companies’ involvement was of course the fact that they represented one of the wealthiest industries in Norway. Although “shipping money” typically was reinvested in new transport capacity, shipping companies and shipowners were among the most important capitalists in the country, and a natural starting point for anyone looking for investment funds. Another reason for the inflow of shipping money into the offshore oil sector was the maritime linkages. The offshore oil sector was not the kind of activity that the shipping companies were used to, but it was not far from it. Shipping companies already had substantial competence and relations within areas such as vessel construction and supervision, classification, financing, insurance, manning and son on. This put them in a particularly advantageous position when the offshore petroleum industry was developed. One example of this bridge between the old and the new maritime interests was the old whale factory ship, Thorshøvdi , which was rebuilt by the Aker Group. A 50-metre drilling tower was added to the almost 20-year-old ship. Renamed Drillship, the former Thor Dahl vessel was delivered to British interests in the autumn of 1967. Earlier that year, the first Norwegian-built drilling rig, Ocean Viking , had been delivered to the US company Ocean Drilling & Exploration Company (Odeco). The rig was responsible for the first major oil find in Norway—what would become the extremely profitable Ekofisk field. The day before Christmas Eve in 1969, Phillips Petroleum announced that the company had discovered Ekofisk and the economic fate of Norway was changed forever.37 However, even before this, shipping interests had entered the offshore sector on a large scale. When Phillips started its activities in 1966, its operations were based at Dusavik, near Stavanger, one of the main supply bases for the offshore industry, and owned by the Stavanger shipping company Smedvigs Tankrederi AS.38 However, for most of the Norwegian shipping companies, the first point of entry to the oil sector was investment in oil companies. In addition to their role in establishing and developing the leading private oil companies, shipping interests were important participants when the activity on the Norwegian continental shelf grew rapidly in the early 1970s. One important area was supply shipping. Several of the larger shipping companies invested in supply ships, but this was also a way into the offshore market for new owners with traditions stemming from fisheries or coastal transport. The initial support for the offshore industry came from rebuilt fishing vessels and simple, smaller cargo ships. The first purpose-built vessels were delivered in 1971, and by 1973 there were 24 supply vessels flying the Norwegian flag, with another 46 on order.42 The herd behaviour again had consequences for the functioning of the market: as the supply of such ships gradually became plagued by overcapacity, shipowners began to cooperate with regard to management and operations. Norwegian companies and seafarers had certain advantages in the operation of vessels in the North Sea. They were aware of and used to the difficult conditions, and also had an advantage in dealing with the routines and procedures of Norwegian bureaucracy. Gradually they acquired competence that enabled them to take on new tasks—traditional supply and stand-by services were supplemented by pipe laying, seismic surveys, well intervention and so on. The Aker group, in cooperation with the Bergen shipping company Odfjell, developed Aker H-3, a platform specifically designed to cope with the depth and the harsh conditions in the North Sea. The H-3 platform was the focus when the second contracting boom took place, in late 1973 and early 1974. By the end of 1974, 54 drilling rigs had been ordered with Norwegian participation. The Norwegian shipowners brought a new element to the oil industry—speculation . Enticed by the high rates, they ordered rigs without securing employment in advance.46 The spot-market strategy that would create enormous problems for Norwegian tanker owners was simply transferred to the rig sector. In 1975 the many rigs that Norwegian owners had ordered began to come on stream, and the market deteriorated. The increasing supply took place against a cooling market, as new taxation rules held the oil companies’ exploration activities back. In 1976 more than 60 new rigs—leading to a 30 per cent increase of the fleet—were delivered. As supply eclipsed demand, rigs were laid up or rebuilt to dwelling and service platforms. Although the financial situation was more positive than in the shipping sector, oil rig owners could apply for support from the Guarantee Institute, and 13 drilling vessels were included. When the market picked up again in the late 1970s, these engagements were settled without losses. When shipping was replaced by petroleum as Norway’s most important export sector, the competence that had been built up in the shipping companies played a crucial role. Sometimes the two maritime industries worked closely together, for instance in the case of shuttle tankers—ships transporting oil from the offshore fields, as an alternative to pipelines. Improvements in technology revolutionized this manner of moving oil. In 1971 it took almost two months for the Greek tanker Theogennitor to move 34,000 tons of oil from the Ekofisk field to Stavanger. During 2001, when oil production peaked, a fleet of 28 shuttle tankers moved a total of 86.4 million tons of oil, in more than 883 separate voyages.48 Compared with Theogennitor , the shuttle tankers’ productivity had multiplied by a factor of 15 as a result of economies of scale—the ships varied from 87,000 to 150,000 dwt—and improved loading and discharging equipment. By the end of the 20th century, Norwegian companies—relying on both capital and competence from shipping—had become world leaders within the advanced, deep-water search for and production of oil and gas. There is a clear upwards trajectory in the value chain when it comes to the Norwegian shipping companies’ offshore involvement. As skills were acquired, the foreign operators were replaced by Norwegian managers, operators and personnel. The increasing offshore activity on the Norwegian continental shelf was a lifeline for many shipping companies, providing new business opportunities and a revenue stream in a difficult time for shipping. However, there were also shipping companies that attempted to enter the offshore sector, and failed. Just as in the shipping industry, strong fluctuations in rates and activity meant that deep pockets—or patient creditors—were an advantage, and at times a necessity. While the introduction of the NIS saved international shipping under the Norwegian flag in the long term, and many seafarers found attractive employment elsewhere, the 1980s was a tough period for those working at sea. As shipping companies replaced the Norwegians with foreigners, “many sailors suffered mentally and emotionally; they lost their income and standard of living in a very short time.”52 By the start of the 1990s, the more than 6000 seafarers that worked on NOR-vessels in Norwegian waters also saw increased competition. The basis was foreign companies, sometimes subsidized, from other European countries. Although the decline in employment halted, and was even reversed, the cultural impact of employment on Norwegian ships has changed dramatically. As late as the 1970s, around a third of the male labour force had spent some time at sea. For many, it was a temporary adventure and a way to see the world in the period before mass travel and cheap airplane tickets. For others, it was a means of escape. Up until the 1970s, a stint at sea was seen as the best way to instil discipline and a sense of responsibility in “unruly boys.” Today, there are few acceptable alternatives. The plan that Erling Dekke Næss presented in 1984 saved Norwegian deep-sea shipping under the Norwegian flag, but it was too late to save most of the seafarers in the ocean-going Norwegian fleet. The autobiographies Næss (1977) (in English) and Næss (1981) (in Norwegian) are among the best insider accounts of modern shipping; confer also Chap. 4. 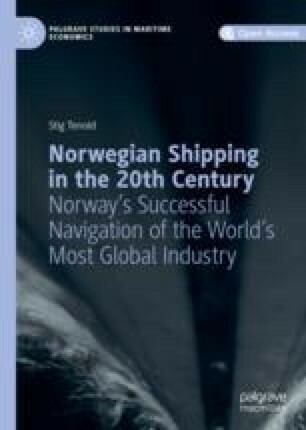 The author of this book was for a number of years affiliated with the shipping research institute that had been established by Næss’ donation . Based on various issues of OECD, Maritime Transport; confer Tenold (2000, 156–158). Estimated on the basis of the Veritas-database, see Tenold (2001) for a presentation, and the list of Norwegian newbuilding contracts in Norwegian Shipping News, 2A, 1974, 41–63. See Tenold (2001, 117–123) for a detailed presentation of the political process leading up to the establishment of the NIS. Verdens Gang , 150282, 12; formally, another lobby organization paid Willoch , but half of this salary was reimbursed from the shipowners; see Espeli (1999, 46). He did not receive such a salary during the period in question, when he was Prime Minister . Norway, Parliament (1986–87) Stortingsforhandlinger 3. juni 1987, 79. Peter Myklebust, Norsk Sjømannsforbund, NTB 240186. See also Bakka (1999). See Vigtel (1988, 87–90) and Bakka (2017, 180–181). Norway, Parliament (1988–89) Stortingsmelding nr. 39 (1988–89), 7. See Halvorsen (2010) for a concise analysis of foreigners working on Norwegian ships in the period 1950–1975. See the analysis in Tenold (2015b). Norway, Parliament (1975–76) Stortingsmelding 23, 29 and Norway, Parliament (1986–87) Ot. prp. 45, 7. Bacon (1842, 205). Kroomen were known as the strongest and best workers along the coast; see Phillips (1889, 463). For Norwegian ships, Madagascar became an important source of temporary casual labour on the other side of the continent. In the 19th century Royal Navy , it was not uncommon to employ Seedies recruited in the Indian Ocean (for instance the Seychelles or Zanzibar) and Kroomen recruited on the West Coast. For an overview of the problem of defining the group, see Tonkin (1974). Arbeiderbladet, 020872, 4 and Kvam (1971, 45–49). See the fascinating recollection of a trip with Krooboys on a Norwegian liner in the 1960s in Bjørklund and Kolltveit (1989, 281–284). In 1984 the Isle of Man became a second register for the UK, and the Dutch introduced the Netherlands Antilles, with an office in Curacao, in 1987. Both of these were “offshore” registers, and were followed by Kerguelen, a “French Antarctic” registry in 1989. NIS was the first “domestic” open register, followed by Denmark and Germany in 1989 and Italy in 1998; see Carlisle (2009, 322) and Sornn-Friese and Iversen (2014). Sletmo and Holste (1993, 249–250). Data on the Norwegian fleet in December 1991 from UNCTAD, Maritime Transport 1991, 11. In addition to the almost 38 million carrying the Norwegian flag, UNCTAD estimates that there was a fleet of almost 19 million dwt flying foreign flags—in total, a fleet of 56,772,906 dwt. Fearnley & Eger, Review 1991, 48, refers to a Norwegian fleet of 41 million dwt. The idea that all countries and companies are equally affected by a market improvement is a simplification: given the different development of the various shipping segments, not all boats are lifted equally. See Tenold (2015a) and Harvey (2005). Calculated on the basis of Statistics Norway (1994, 532–533 and 544–545). Although the figures never returned to those of the Golden Age—even when we leave out petroleum exports—1987 was a low point. Gross freight earnings made up 37 per cent and net freight earnings 23.3 per cent of total exports in 1970. By 1987 the shares had fallen to 13.8 per cent for gross freight earnings and 3.4 per cent for net freight earnings. This was partly a result of Norway’s emergence as a major oil exporter but even if we exclude the effects of the petroleum exports, there is a substantial decline, to 18.9 and 4.6 per cent, respectively. Due to a smaller fleet and a lower freight rate level, the revenue from shipping declined in absolute terms as well. See Kvendseth (1988) for Ekofisk and Hanisch and Nerheim (1992); Nerheim (1996); and Ryggvik and Smith-Solbakken (1997) for a more comprehensive history of the development of the Norwegian offshore oil and gas industry. See Nerheim and Utne (1990) for the well-written business history of Smedvig, an enterprise that went through the full conversion from a traditional shipping company to an offshore company during the period 1965–1995. Smedvig had also participated, together with a cement company, another shipping company and a shipbroker , in the first Norwegian offshore base. After the two consortia were merged in 1965, 11 of the 20 participating companies had their background within shipping ; see Saga Petroleum (1997). Two of the best introductions to the shipping companies’ various engagements in the offshore oil industry by the early 1970s, are Seeberg (1974) and Tveit (1973). Calculated on the basis of Tveit (1973, 15–18). The other two major Norwegian companies were Statoil, which was fully state-owned, and Norsk Hydro, where the authorities owned the majority of the shares from the early 1970s onwards. See Ryggvik (2000) for a good introduction to the ownership development. Hanisch and Nerheim (1992, 228–231). R.S. Platou, The Platou Report 1971, 23. See the overview in Tenold (2000, 356–358). Hanisch and Nerheim (1992, 233). Hanisch and Nerheim (1992, 239). Norway, Parliament, NOU 1983, Skipsfartens konkurranseevne, 76–77. Hanisch and Nerheim (1992, 365). Calculated on the basis of Statistics Norway (1994, 487). Norway, Parliament, Stortingsmelding 31 (2003–2004), 30.